What was the initial result you were looking for when you started coming to see me? I originally came to Marie looking for relief from TMJ symptoms. Her CranioSacral techniques were quickly effective and continue to keep occasional flare-ups minimal in number and severity. It soon became apparent that Marie's treatments would also help me with other chronic pain and movement problems, the worst being in my lower back and hip areas. This has improved the quality of my life a great deal, and allowed me to do both routine activities that were becoming difficult and occasional activities like hiking and paddling. Tension in neck and shoulders, wanted some relief. Then after serious car accident wanted relief from the immediate pain, and also healing to prevent long term issues. Initially I was looking for a new treatment option for managing neck and shoulder stress that often led to headaches that lasted 4 to 5 days. I no longer experience these headaches and I contribute your treatments to helping with this. Other issues you have been a part of healing process are: ergonomic shoulder pain, aching and swollen knees. What results did you get from your treatments/massages? Marie's CranioSacral and Ortho-Bionomy treatments have helped keep other problems from becoming chronic, as they often would before starting an ongoing treatment program (muscle spasms and ligament and tendon problems). After I severely injured a foot, her treatments and advice got me mobile again and allowed me to carry on a normal routine. Marie has also used Lymph Drainage occasionally when glands have become swollen or painful and this has been very helpful. Marie's treatments have helped me avoid using a dental appliance for TMJ, which I detested, and painkillers for the other chronic and acute problems areas. Also, I have had far fewer viral infections since I started regular treatment. Less illness, less pain, better movement all contribute greatly to a better quality of life for which I am very grateful. I have had amazing results with Marie. She has helped me heal from a car crash, and other issues over the years. At the same time she has helped me with stress relief. She is an integral part of my health team. I had a little knowledge of the treatment I wanted (CranioSacral) and I find it works better for me, I guess not everyone is receptive to this massage but I think you get results faster. I don’t always want my muscles pushed around, especially if I’m hurting already. Are there any specific attributes you like the most about my treatment/massage, my therapy room or me? It's a short easy drive to Marie's home on a country ravine, and parking couldn't be easier. Her home is very pleasant and clean and the treatment room is a calm oasis. Marie herself is a warm, gentle and caring person who is easy to talk to. She is genuine in sharing her knowledge and ideas, and patient and understanding when we 'forget' to follow up with self-care at home. in her approach. Always feel like I’m respected and heard, and that we are partners in my treatment. You are so calm and reassuring, which in turn makes me relax. I like the way you explain what you are doing and how my muscles are reacting to the treatment. I find it interesting when you find I have tension elsewhere. Your treatment room is awesome, it’s spacious and not claustrophobic, that in itself is relaxing. What would be three other benefits about receiving a treatment/massage from me? I believe that without your treatment I would have had long-term negative impacts from the car accident. You have helped me recover from issues that have stumped the medical profession, largely because of your problem-solving ability, and your commitment to finding what your client needs to heal. You clearly demonstrate your understanding of the interconnectedness of all the body’s systems, which has contributed greatly to my health. You listen. You are adaptable to my current/changing news. You don't tell (me) what I need, you ask me. Your suggestions of what I can do and your quiet persistence until I can hear you (like water dripping on a stone) and you have never been wrong. Would you recommend my treatments/massage services to others? If so, why? ​until you find what works best for the individual, and their unique circumstances. You are very intuitive, and very in tune with the body, blockages, and areas that need to be worked on. Your intuition is coupled with your solid theoretical background, driven by your curiosity and continuous learning and training. Yes. Your services are a key part of my long-term healthy approach to life. Despite the various issues I've had over the years, your treatments have played an important part in correcting the issues and finding a healthier path. Professionalism and discretion. Gentleness and willingness to explain the techniques and their effects. Marie is a wonderful healer. I could say more. You truly have helped me through some of the most difficult times in my life. You have been a consistent beacon of hope, healing, and understanding in the midst of some horrible challenges. You are amazing! 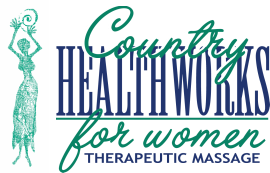 I have been regularly receiving treatments at Country Healthworks for Women for about 15 years. It helps keep my spine straight and my migraines not quite as bad as they have been. Marie has many different tools to use in a session. Some days I need mostly CranioSacral, other days Ortho-Bionomy. Arthritis, trigger fingers, pinched nerves, it doesn’t matter, she looks after my whole body. I feel very lucky to have found you and very grateful for your continuing care and generosity.